LADY AND THE TRAMP - WALT DISNEY - Original Spanish One Sheet Poster. 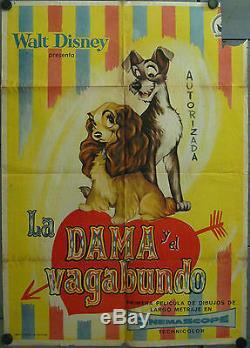 Spanish title: La Dama y el Vagabundo. US title: Lady and the Tramp (1955). Direc ted by Hamilton Luske, Clyde Geromini and Wilfred Jackson. Size: 27x39 inches (70x100 cm). Original poster for the spanish first release. Top right corner is missing. Slightly teared with minor missing paper along edges. Slightly wavy because of humidity. Very minor fold separations along fold lines. Minor missIng paper at crossfolds. Brown stains along fold lines. It has written "Autorizada" at right side. CHECK OUT MY OTHER ITEMS! The item "VY03D LADY AND THE TRAMP WALT DISNEY ORIGINAL 1sh SPANISH POSTER" is in sale since Tuesday, November 7, 2017. This item is in the category "Entertainment Memorabilia\Movie Memorabilia\Posters\Originals-International\1950-59". The seller is "fantomas38000" and is located in Barcelona. This item can be shipped to North, South, or Latin America, all countries in Europe, all countries in continental Asia, Australia.